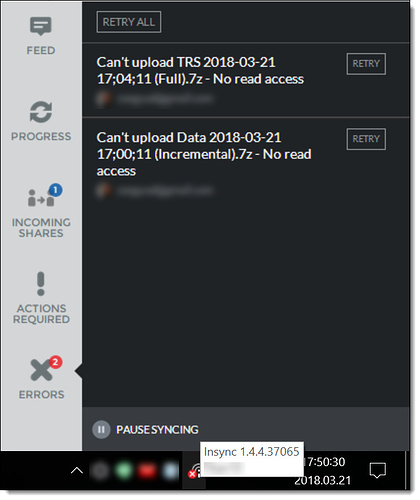 It probably wouldn’t bother me so much if Insync didn’t show a red X on its icon once it gets one of these messages, but I feel obligated to clear that by clicking Retry All because otherwise I can’t tell if my own files (in different folders) are getting updated by Insync as I make changes to them. Does this error appear because she saves a file but her Windows system still has its permissions locked or something, so Insync can’t access it right away? Hi @Orrin_Cummins can you send in your logs along with the link to this post to support@insynchq.com? Done, thanks for the quick reply. Hello @Orrin_Cummins, I just checked the logs. Yes, the errors happened because most likely, the files were locked by the MS office or some other program while Insync was trying to overwrite them with the latest remote versions. We are working on improving the error message and the automatic retrying. @dipesh, it sounds promising , I miss this feature (auto retry) very much on Windows. Could you please give us a hint about the ETA of this feature? Unfortunately, we don’t have an ETA of this feature but we will work on this soon. FYI Running Insync on my Ubuntu 17.10 main machine and Windows 10 on my secondary machine I also have this persistent issue concerning items in my GDrive Mozilla Thunderbird 'Profile/ ‘Mail’ folder *.msf files. This is reported by Insync only on my Windows machine: something to the effect that *.msf file cannot be replaced/removed ‘due to unhandled error’. When I hit ‘retry’ all becomes well, so it is not a major issue, just a minor irritant. It probably started about a year or so back. Hi, @dipesh, a few months have passed since the last update. Any news on this issue? Maybe now you can see the ETA? @Csaba_Egyud We will roll out some improvements in this regard in our next build slated to release within the current month. @dipesh, I have installed 1.4.4 and the No read access errors are still hanging there until I click retry. Should I set s.g. in the config to enable automatic retry or is this feature still being baked in the oven? @dipesh, 1.4.5.37069 still does not automatically retry. Any update for the issue? Thank you. Hi @dipesh, Despite your nince announcement in February, I still have errors hanging around until I manually click Retry in v1.4.7.37098. Any news about a periodic auto-retry feature? I know the reason of the error, and the files are always released in a few minutes (backup software locks them until archiving). So an auto retry would be successful after 10-15 minutes. It could be an on/off option in the settings with some adjustments like “retry after minutes” or “number of retries” if a retry fails. I miss this feature very much. @dipesh, I’d like to kindly remember you that you announced this feature in February and tomorrow we enter July. Could you please say s.g. about this issue to let us know when you plan to introduce a solution? I think it is not a big improvement and I cannot imagine the reason of why it takes so long. @Csaba_Egyud Unfortunately, we haven’t been able to devote time for this feature as it is not a priority at the moment. We sincerely apologise for the inconvenience and appreciate your patience. I must say, it is surprising to me that this is not a priority considering that the bug completely defeats the purpose of an automatic cloud backup solution. If I have to manually sync the files then what is the point of Insync? And if I don’t manually sync them and my system crashes, any changes will be lost.